I’m a man and I’m not afraid of storm, thunder or any other threats. but this darkness…OMG, It’s so scary :(. The worst part is, I just watched a horror movie ‘Don’t be afraid of the dark’ at my friends place. I did not complete the movie and I asked my friend to drop me. When I’m back home, the power has not yet come. My friend asked me to sleep at his place, but for some unknown reason I said I’m good. I’m surviving with the lights from my MacBook Pro’s screen. It is my only company now. It has 51% of battery power and I hope the lights will be back soon. While typing this post on TextEdit, my computer scared me for a moment by shouting ‘It’s 11’o clock’. Let me tell victoria (system’s voice) not to announce the time when it is 12.00. Hmm, I’m taking an oath now…If I survive tonight, I’m going to be the wisest person in the world from tomorrow. I’m done with the post and I will be updating this in my blog when the power comes. God! I don’t pray for success, but I ask for POWER. When you get up you will laugh, there was nothing to be afraid of darkness. Did you see any ghost. Using your last bit of power to post on your blog. That’s real blogging dedication. Thank you for sharing that event in your life. horror movie, no lights and to add on, nobody to accompany. perfect combo to scare the life out of anybody. I am not afraid of darkness but I don’t watch horror pictures. I feel troubled to watch them! Wow, you too kam ? 🙂 i thought im the only guy sleeps with the lights on. 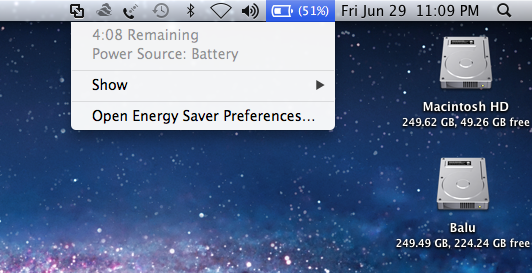 Your MacBook Pro lasts for 4hrs 08 mins with 50% of battery! I envy you man!! Seriously.